Using lots of goodies from the 2wenty Thr3e range including papers, chipboard stickers, stacked stickers & journal cards.....all available in store! A close up of my cluster...which also has a gorgeous Lil' Red Rocket October Afternoon fabric covered Pear button <3. The large flower is from my recent prize pack from Manor House Creations....and I have misted it with GM to help tone in with the rest of the layout. For my background on the pink "Oh happy day" paper, I have used a CW brick template with white paint & then randomly sprayed TA Wheatfields & Suede Glimmermist. A close up of some of the chipboard stickers. The colours in this range are just gorgeous & I'm really looking forward to creating more with them. 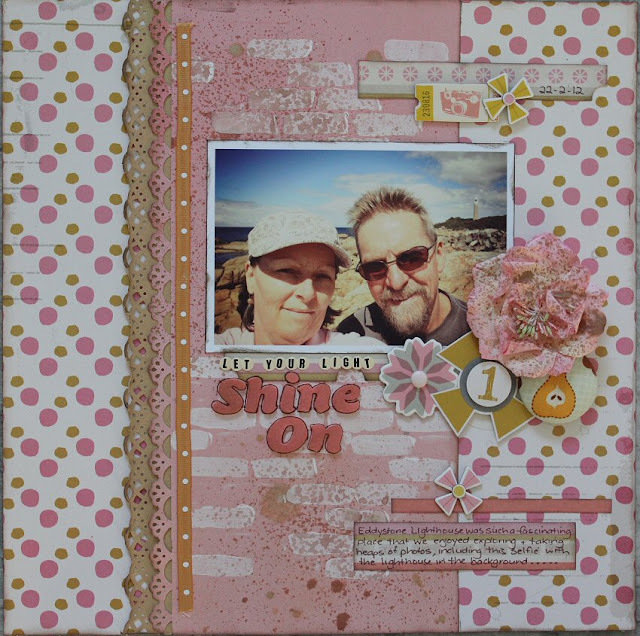 The journal tag pack is just fabulous...there are 24 pages....all different designs! And the stacked stickers & chipboard stickers are great & easy to work with too :) I also have some Washi Tape from this range in my kit...so I'm looking forward to creating with that in my next layouts. Photo is from our trip to Tassie....at the Eddystone Lighthouse (which is behind us in the background). Not just of the lighthouse, but also the beaches, rocks, shacks etc all around the area. Looks like a great collection of papers - love the colours too! Beautiful!! I just love the details- your outlined title, the brick work, the bit of misting- fabulous! Linda, your LO is so romantic:) and I LOVE this picture, you're so beautiful couple! Such a pretty layout Linda. LOVE it!!! Love your travel LO! Nice misting and embellies.